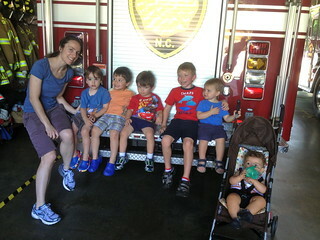 A friend made arrangements for our kids to have a tour of our neighborhood fire station this past week. I didn't have grand expectations but it turned out to be fabulous. It was very informative and the kids had a blast. One of the fire fighters demonstrated how he puts on his gear and how each piece helps protect him from a fire. Another of the fire fighters said, "He may look like Darth Vader, but don't hide from him if you see him in your house." I had never thought about it, but I imagine one so garbed could be a bit scary to a small child. 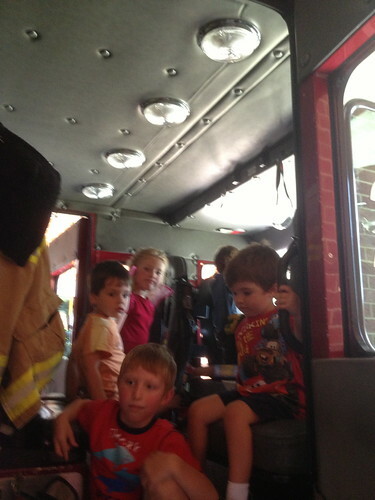 They went over other fire safety information and the kids got to climb aboard a fire truck. 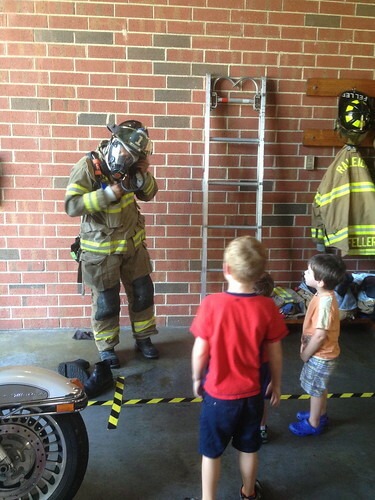 They even got out the big hose and let the kids turn it on and off. All the firefighters were very friendly and I was very happy that a female firefighter was present for Elisabeth who was also the only little girl among six boys. I made sure to point out that she could be a firefighter too, but Elisabeth, clad in high heel, dress-up shoes and fairy wings, shook her head and said, "I don't want to." As long as she knows it's an option. Any parent of a little kid who loves to swing looks forward to that moment when they can swing themselves, because sometimes it just goes on and on and on and on.... And if you slack off at all, "Mommy, faster! Swing me, mommy, swing me!" I remember being elated when Jonah finally figured out that he could swing himself. Little sister has been even more demanding when it comes to the swings. A couple of weeks ago it finally happened. She was able to keep herself going on the swing unassisted. Interestingly, for both children, this milestone occurred within a month or two of their 5th birthday. So, if you have a demanding 4-year old on your hands who loves to swing and, if permitted, would think nothing of having you stand there endlessly pushing their little bums while they enjoy the wind in their hair, be encouraged that they will figure it out. Once they've mastered the physics of it, just think - you could enjoy that cold beverage or read a good book while they swing themselves!